1 twin/double bedroom, 1 double bedroom (includes travel cot) both with fitted wardrobes and fully air-conditioned. Plus open plan ground floor studio lounge area with 5ft and 3ft sofa beds.Dining table and chairs for indoor meals including baby seat. Fully equipped open plan fitted kitchen includes washing machine. Full bathroom suite with shower. Downstairs toilet wash room. Front and rear verandas with sun loungers. Rear veranda area boasts full purpose built BBQ. Access to communal swimming pool. All linen provided. Android TV box with most world wide Sports channels available including Movie channels and UK channels including BBC and ITV. The tourist area of Cyprus's South East coast of the island is just 35-40 minutes drive from Larnaca International Airport. Here is one of the island's idyllic resorts where one can find golden sandy beaches and rugged cliffs complimenting the tiny bays while overlooking the early morning sun as it slowly rises above the horizon, as if emerging from the crystal clear waters of the Mediterranean sea. It is here within this poetic scene in Kapparis, that one can lounge at 'Diamantina Villa' in Florina Villas with their tempting communal swimming pool, or escaping to the quiet solitude of a lonely stretch of beach for that intimate picnic. Explore this enchanting locale for a few miles inland and you will discover the delightfully scenic 'valley of the windmills' where what seems like hundreds of rotating fan blades help to pump the water that irrigates the surrounding fruit and vegetable fields. Paralimni Town: Which is 2 kilometres inland from 'Diamantina Villa' is a lovely small town which has a mixture of age-old customs where the local residents still practice many of their historical traditional farming techniques that have lasted for generations, and a new about-town feel to the place of exquisite coffee shops, trendy designer and jewellery shops where you can find unique exclusivity items! 'Diamantina Villa': For the elite tourist on beach holiday, 'Diamantina Villa' in Florina Villas has the distinction of offering ideal high standard self catering accommodation fully air-conditioned throughout, and high standard furnishings and fittings. The nightlife of Protaras is filled with the sounds of music from the popular trendy bars to the romantic bouzouki songs that can be heard at the various traditional taverns. The aromas of freshly grilled cuisine fill the air, tempting holiday makers to dine at any of the countless restaurants and taverns available. Overall, the typical Cypriot kind, sincere genuine hospitality is very much in evidence wherever you go! If you want lovely accommodation on one of the most select developments on the South East coast of Cyprus, a privileged location within easy distance of all the holiday amenities on offer in this exciting area and fantastic value, then 'Diamantina Villa' is for you. Please see the tariff and availability chart. There is also an outside shower by the side of the villa where one can shower off before entering the villa after coming home from the beach or pool. Android Box with most Worldwide Sports Channels streaming Sky Sports and UK channels BBC and ITV and Movie on Demand Channels + Kids Channels; FREE WI-FI to connect with your own IPHONES and TABLETS! It was wonderful stay in Harry's villa in Kapparis! The house is very nice and cozy, with an excellent location in short walking distance to the sea. Great barbecue facilities and terrace. Harry was always available for questions or helping in any problems. The only thing we missed was dishwashing machine. We hope come back here next year! 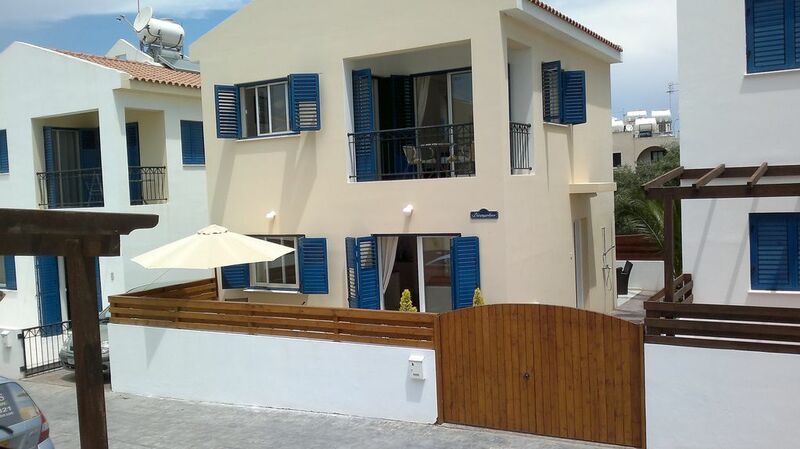 Lovely villa in a nice location in a quieter part of Cyprus but with plenty of good bars and restaurants. Villa has all we needed to make our stay comfortable. Kapparis is a nice location with plenty of good bars and restaurants and two nice beach's close to the villa. This is an ideal property in an good location hence we will be returning in August for another two weeks. We stayed at the Villa in Kapparies in August 2013. We found the property well a maintained and functional for the 2 week stay. When we arrived the open planned layout on the ground floor was more than adequate to have 6 adults staying. The beds were comfortable and bedrooms were also has plenty of space to hang your cloths and store luggage. The villa has a communal swimming pool which we used often during our stay. The local people were very friendly and the pool café was open for breakfast to dinner time! The walk to the town is only 5 minutes, and there were plenty of options to eat and drink. The beach was only 15 minute walk, the sandy beaches and lovely clear blue sea is where we spent most of our holiday. We would book the villa again. On a nice quiet road, the villa is bigger than it looks from the photos and videos. Front and rear verandas are nice for sitting out in the evenings. The neighbours even water the plants! The pool is a 5 min (max) walk, but it's worth it, very clean, with a pool bar and bookcase full of well thumbed books. The pool complex is shared by residents and owners of certain villas and apartments (mostly ex-pats), and is gated. Don't be put off! Just get someone's attention, tell them you're staying in Harry's villa and you'll be made more than welcome. Kapparis is nice and relatively quiet, but has reasonably good bus links. Standout restaurants are Faliros, Just Italian and Karas, though there are plenty more. (Mello and Magazaki are the best of these.) LOTS of dishes come with chips! Kennedy Avenue has plenty of supermarkets and small shops if you run out of food, suncream or other essentials. There are 3 main beaches : Fireman's, Malama and Agia Triada. Malama is a small shallow cove, right at the bottom of a hotel/apartment complex. It's the busiest, but it does have water sports, including para-gliding, which is an amazing experience! Agia Triada is the largest, and also has water sports; we didn't spend much time there but it looks like a perfectly nice place to spend the day. Fireman's beach is pretty small, but really lovely and clean. Sunbeds cost 2.50 for the day (umbrellas the same) and the sea is beautiful, clear and not too deep, a great place for snorkeling. There are toilets and a canteen at the top of the hill (chips etc. ), and the owner does love to belt out the odd power ballad so it's not completely silent! There was space every day day we went down there, with a mixture of families, groups, and a smattering of locals at the weekend. You can head back 10 mins to the roundabout to catch buses into Paralimni and Agia Napa. Paralimni is the main hub for buses to places like Nicosia (just under 2 hours) and Larnaka (45 mins). They're pretty reasonably priced from 1 to 7 euros depending on distance. There are also tours available from Kapparis to places like ancient Salamis (in the North, take your passport) which are well worth it, and negotiable on price. Short version; we'd go back in a heartbeat. There's plenty more to see. You can probably drive across in 2-3 hours and see much more, so this is my plan for next time! its always nice to receive a great review! Time Just flies when We holiday at Our villa too! Absolutely fantastic place to stay. The villa is very comfortable, has all the amenties you need, front and rear patios very handy when chasing the sun! We found it very easy getting around without a car. The restaurants, supermarket, bakery, pool and pubs all just a short distance away. Firemans Beach is very peaceful, not too busy whilst we were there. We ate every night at Faliros Taverna which is only 5 minutes walk. The food was lovely and plenty of it, especially the meat and fish meze! The remainder of the pubs all do good English food, especially The Pig + Whistle. You can get a bus into Protarus for 1 euro each way, it's only 4K journey. I would definately recommed this villa for adults and young families. The villa has a secure gate with a bolt at the top, out of reach, so children can roam freely. The pick up from the airport is well rehersed by Wayne and Michelle. We phoned Wayne as we left the terminal and he was straight there within 2 minutes. 40 minute trip. We would definately return. Thanks Harry + George. Fantastic to hear such a good review of our villa and the resort! 'Diamantina Villa' is located in Florina Villas in the privileged area of Kapparis area, less than 500 metres from the famous 'fireman's beach' which has breathtaking views (named 'fireman’s' because the local fire station staff do their training here!-see photo 6 & photo 21). The nearest airport is Larnaca International which is 35-40 minutes drive from 'Diamantina Villa' in Florina Villas, Kapparis, Protaras on the south east coast of Cyprus. The villa is 100 metres away from Kennedy Avenue where all essential amenities are easily provided including highly recommended fine restaurants such as Faliros(steaks/grills/meze), Karas Fish Restaurant(daily fresh fish & seafood), Just Italian(super Italian cuisine) plus many others. There are several tavernas/bars. The Mello Bar, Bar Divino , The Wooden Crest & the trendy Pig & Whistle Bar to name a few, plus all usual car hire, supermarkets and travel shops(glass-bottom boat excursions) outlets.